Offering you a complete choice of products which include steel railing pipes, stainless steel railing pipe and stainless steel railings. To meet the diversified requirements of our prestigious clients, we are engaged in offering Steel Railing Pipes. The offered pipes are manufactured in accordance to industry norms and quality parameters. In the offered pipes, the steel alloy used has been approved and certified. In addition, these pipes can be built and developed according to the specification provided by the clients. Furthermore, our professionals opt for strict quality inspection made on the pipes to ensure high performance. Apart from this, clients can get the pipes from us at industry leading rates. Pioneer in the industry, we are engaged in presenting an impeccable range of Stainless Steel Railing Pipe. 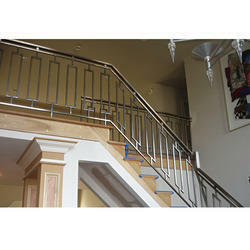 The offered railing pipe is used in covering and providing hand support to stairs, balcony and other industrial passages. Due to corrosion resistance specifications, this railing pipe is extensively used by the hospitality sector. 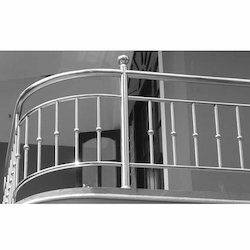 In order to deliver the high durability, this railing pipe is manufactured utilizing quality stainless steel alloy. Additionally, the provided railing pipe is quality tested on more than a few parameters to assure high tensile strength.